he Diamond Pearl Brooch was designed to be worn either as a brooch or as a pendant. 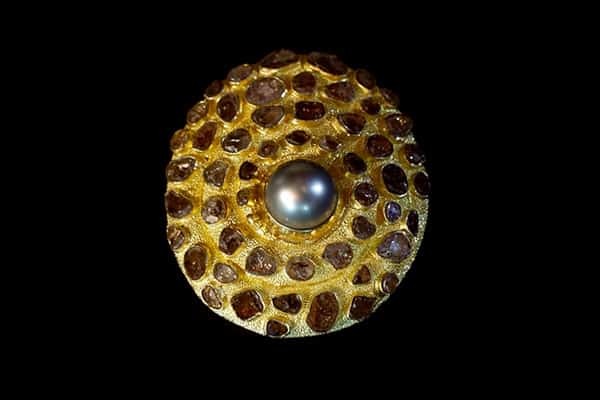 In this 22 karat gold piece of fine art jewelry, you can see that a large black south sea pearl is set amidst a blossoming spiral of 52 natural, uncut diamonds. Most people know about diamonds and Marlin Monroe, but what they don’t realize is that diamonds were first used in India about eight hundred years before the birth of Christ. The name diamond itself is derived from the Sanskrit root ‘Dyu’ meaning ‘luminous being’. Diamonds were expensive and exclusively worn by royalty because they really were rare. Massive diamond reserves have been discovered and they aren’t rare today. The only reason that diamonds are expensive is because of the manipulation of supply and price fixing. In fact,natural, uncut diamonds like the ones set in this pearl brooch, were considered to be the most valuable. This is because it was believed that the magical properties of diamonds were destroyed or reversed by any kind of alteration. Like many pieces of the symbol jewelry that you’ll come across in the Zoein Jewels collection, the diamond pearl brooch is based on the sacred geometric proportions of a golden spiral. If you have a trained eye, you may be able to recognize that this is a golden mean spiral. The Golden Mean is represented by Ø-ﬁ, the 21st Greek letter which appears in what mathematicians call the gnomon. The gnomonic spiral is the basis of the phenomena of growth and is in some ways similar to a line, in that its two ends hurl themselves in opposite directions towards infinity, one ever diminishing and the other ever expanding. If there was one form that both embodied the nature of life and then infinitely expanded beyond its finite limits it would most certainly be the spiral. In the design of this diamond pearl brooch pictured to the right, you can clearly see a charted path of the gnomonic spiral. From the spiral found in the first protozoa forms of life to the nebula of spiraling galaxies is etched its miraculous nature. It is embodied in whirlwinds, ocean currents, the flight of birds in the fetus and the umbilical cord that connects it to its mother. 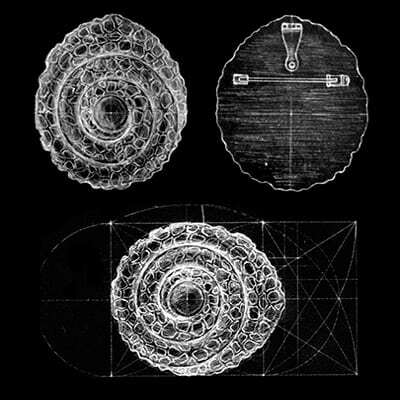 The Golden Mean or logarithmic spiral, is “so rich in geometric and algebraic harmonies that traditional geometers named it Spiral Mirabilis, the miraculous spiral.” It holds the secrets of reincarnation—it exhibits the accumulative form of growth in which the old form is contained within the new. This form of growth implies a different perception of time; instead of a one way flow, from past to future through the present, this time corresponds to cycles of duration, which like the days of the week, simultaneously arise from and return to themselves. Even though the diamond pearl brooch may may appear to be only a beautiful piece of fine art jewelry, you can now appreciate that it’s much more than meets the eye.